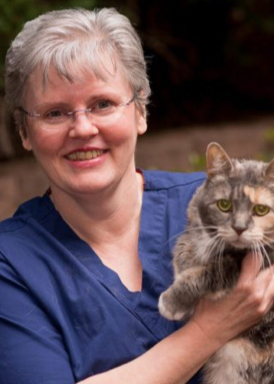 Dr. LeGrange obtained her DVM degree at Louisiana State University in 1991. She also has a BS degree in zoology from LSU and is a passionate LSU Tiger fan, especially for baseball and football. After veterinary school, she completed a one-year rotating small animal and surgery internship at NC State, and that is when she fell in love with the state of North Carolina. After a three-year internal medicine residency at Texas A&M, she moved back to the Charlotte, NC area in 1996. There she practiced internal medicine for 20 years before joining Upstate Vet in 2017. She and her husband Mark have been together since 1983. They have no children but are cat lovers and currently have two cats in the household. Her areas of interest include gastroenterology, liver diseases, endocrinology, infectious diseases, and cardiology, but she enjoys all aspects of internal medicine. Outside of work, she enjoys yoga, pilates, and tai chi, as well as walking trails along the Blue Ridge Parkway. She is an avid sports fan and enjoys watching the Carolina Panthers, Atlanta Braves, and minor league baseball teams the Charlotte Knights and the Asheville Tourists. She and her husband are excited to be in Asheville, as it has been one of their favorite places to visit since they spent part of their honeymoon there in 1991.